No. Just roll your dice however works best for you. Four successes, thanks to Fine Jewelry. I could take the Tommy Gun or Lucky Talisman, or take a Debt and immediately remove it with my ability to take both. Did anybody particularly want to try for either of those? I vote you take them both, can always trade away. Oh, I can? That works, then. Barring objections, let's do that. Jenny purchases a Tommy Gun and a Lucky Talisman. By the way, it looks to my untrained eyes like the .25 Automatic is compatible with the Tommy Gun. 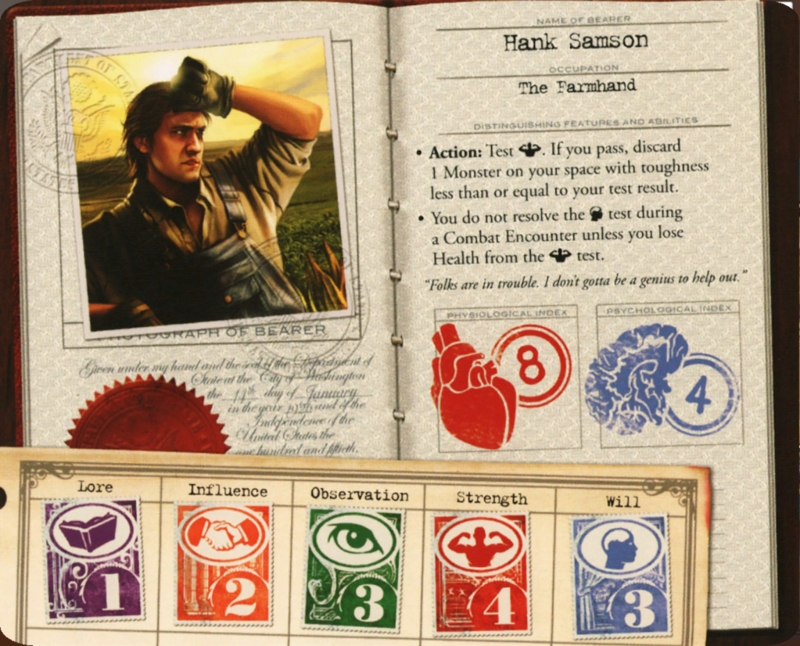 The rules say that "you can only use one card effect that provides a skill bonus during each test," but only the Tommy Gun actually increases the skill -- the .25 just gives you an extra die. Arcane Tome (3) - Item - Tome: Gain +2 Lore when resolving Spell effects. When you perform a Rest action, you may test Lore. If you pass, gain 1 Spell. Forbidden Text (2) - Item - Tome: Gain +1 Will. Gain +2 Will during combat encounters. 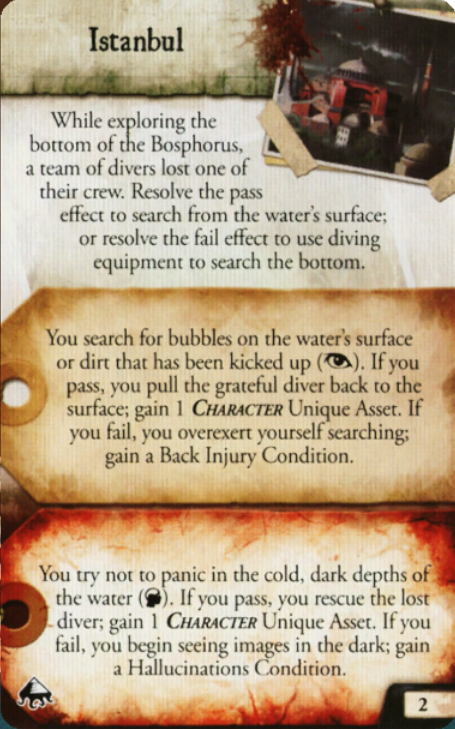 Again, to clarify the rules on skill bonus stacking: the Forbidden Text's +1 Will bonus is persistent across all skill checks, and you can use its additional +2 Will bonus during combat encounters if you don't have a better "during combat encounters" Will bonus on something else. Travel to Rome, grab a sea ticket, then use my special ability to take the train to Pyramid. I'll pick up the clue in the Encounters phase. You hope to convince Gotou Shinpei, the Minister of Home Affairs, that occult forces endanger Tokyo. Test Influence. If you pass, he'll do anything to help; gain a Funding Condition. If you fail, he sees you as a saboteur; gain a Detained Condition. Flipping this card is likely to get you some loot but get rid of the Funding card. Choose yourself a choice! Will is your better skill, but a Back Injury is easy for you to heal. You get caught robbing the Esoteric Order of Dagon in Innsmouth. You claim innocence. Test Influence. If you pass, you walk away with stolen loot; gain 1 non-Ritual Spell and 1 random Magical Asset from the deck. If you fail, the High Priest hexes you; gain a Blight Condition. Ouch. You'd think the rich girl would have an easy time talking her way out of this. You may wish to use your Lucky Talisman. If you choose not to, let me know before you read the spoilerpop. The good news is that these things usually selfdestruct come Reckoning. The bad news... you probably don't want to be near anyone else when that happens. You observe a celestial phenomenon occurring in the night sky. Test Observation. If you pass, another world blinks briefly into existence while you watch; gain this Clue. If you fail, your eyes grow heavy as you watch the dancing lights and you dream of other dimensions; gain 1 Madness Condition. The next expedition is in the Himalayas, practically next door. Maybe this one'll have an Artifact? We'll move to the Mythos Phase once Jenny and Vincent make their decisions. Last edited by Mogri; 09-29-2018 at 12:53 PM. Is that actually a choice? Seems like it calls the top one the pass and the bottom one the fail. Is there an earlier test? I’ll do the top one if possible. 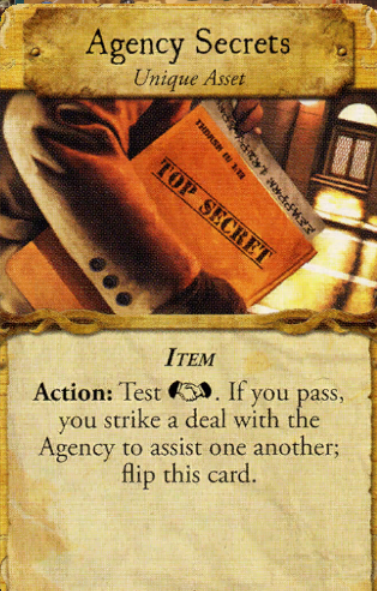 What does the target sign on the funding card mean? Just that I can choose to flip it? Yes -- most expeditions and otherworld encounters have a test up top. The second section is the "pass" section and the third is the "fail" section, but in this case, you choose which one to resolve. That's the Reckoning symbol. It will trigger automatically on certain Mythos cards. Ah, since I'm here, I guess I'll roll for your expedition. 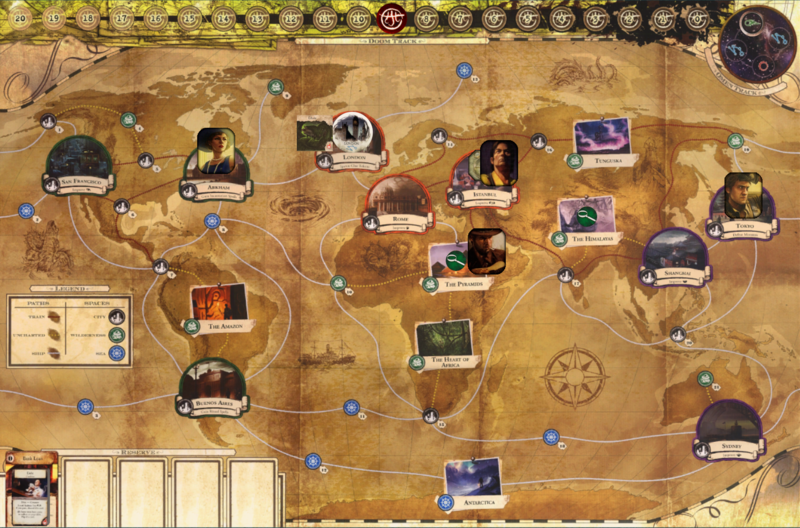 A clue token is spawned. In this case, it's in space 4. A Rumor token appears in London to remind you that you can have a rumor encounter in London. 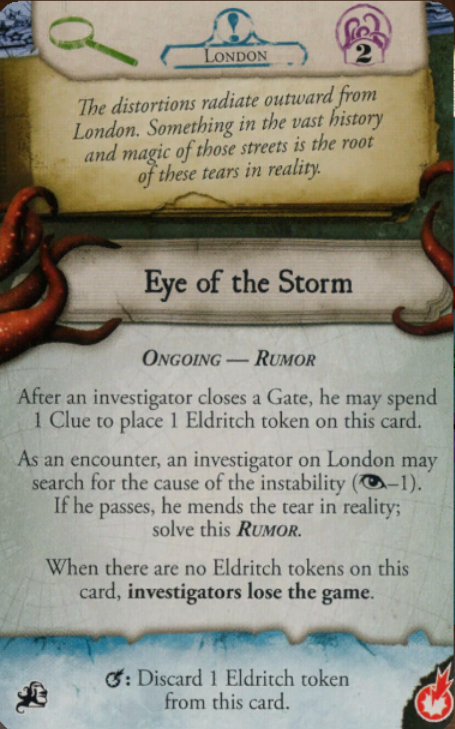 Two Eldritch tokens are placed on this rumor. As possible game-end conditions go, this ranks as a solid "not so bad." Closing gates is something you'll want to do anyway, and it's entirely possible you'll be able to ignore this for the rest of the game, since you only lose Eldritch tokens on Reckoning. The first four cards of the Mythos Deck contain one green card, two yellow cards, and one blue card. Blue cards, like this one, are always Rumors, which are persistent effects that do nasty things when ignored. (Well, that's the intent, anyway.) 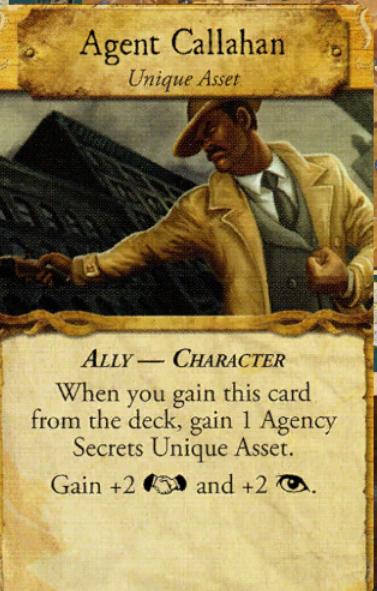 Naturally, they'll tend to spawn a Rumor token, and they also spawn a Clue, but aside from that, it's just the card's effect. Green cards always Advance the Omen, Monster Surge, and Spawn a Clue. Monster Surges cause monsters to appear at each open gate -- only one monster at this player count. 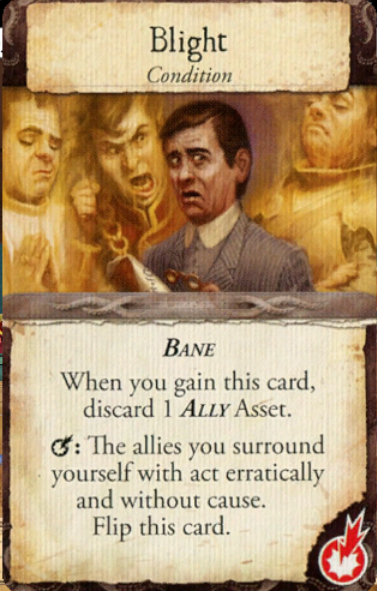 Yellow cards always have three symbols: Advance Omen, Reckoning, and Spawn Gate. 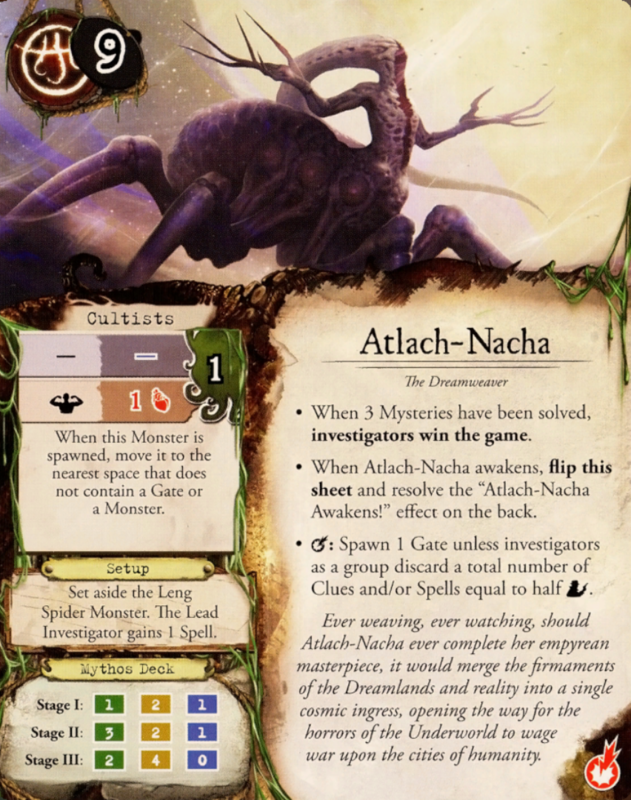 Under Atlach-Nacha, Half of the first four cards are yellow, a third of the next six cards are Yellow, and two thirds of the last six cards are yellow. The Reckoning is the important effect here. It means that at the end of the game, you'll be getting Reckonings one after another. Aside from the Rumor and your possessions, Atlach-Nacha also has a Reckoning effect, as seen above. In light of the current rumor, maybe it's not so bad? It's the end of the Mythos Phase, so Hank may designate a new lead investigator. But it's optional. Just remember that turn order will always go clockwise -- Hank, Vincent, Jenny, Pete. I guess I’ll buy a train ticket and head down to 17. Do the city encounter. It's a secret to everybody. Does this change your actions? Would it be possible to indicate where things are on the map? I'd be fine with it listed in text below the map so that you don't have to image-edit the map itself. Just to confirm: looks like there is no way for me to get to the Himalayas this turn, since ticket movement has to be second and there are no train or sea paths leading there, right? You know what would be really useful, though? Posting the correct map. You're right about the Himalayas. Seems like Pete could make it there by grabbing a train ticket, using his special action in conjunction with the train ticket, and then using the bonus action to move to the Himalayas. OK...doesn't seem like there's a whole lot that's useful I can do if Pete's going to go for the mystery. My tentative plan will be to acquire assets and grab a sea ticket to prepare for new things popping up next turn, but if someone can think of something more useful to do, please let me know! Oh hey! 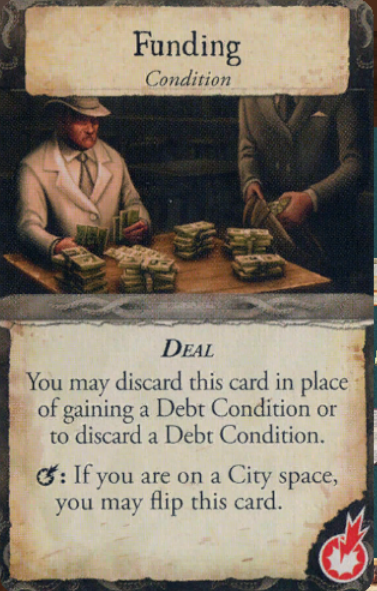 Here's a rule I didn't realize: if you don't buy anything on an Acquire Assets action, you can dump one card from the reserve. So as not to retread too much of last turn, we'll ignore that Vincent had that opportunity, but it's something to remember going forward. Oh snap, I’ll totally try to strike a shady deal rather than buy a train ticket. I’ll still head down to 13 afterwards and do the city encounter. Jenny and Pete, I'm gonna give you the benefit of the doubt and assume that your action depends heavily on the outcome of Vincent's Agency Secrets outcome. 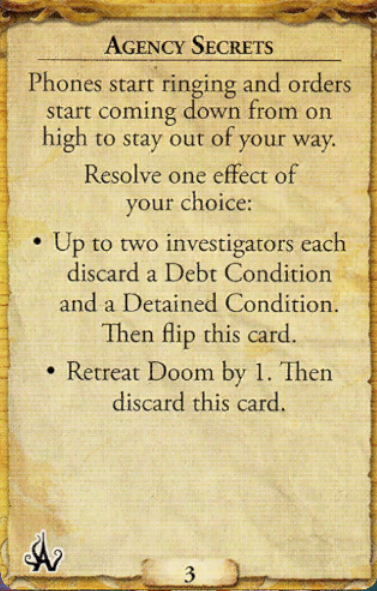 Vincent, even though no one is in Debt or Detained, you can still choose the first option in order to retain the card. On the other hand, even though we're at our starting Doom value, it's still legal to retreat Doom by 1 if that's what you prefer. Hmm. Mainly I'm just not sure what I should be trying to do. 1. Solve mysteries. That's the way to win. 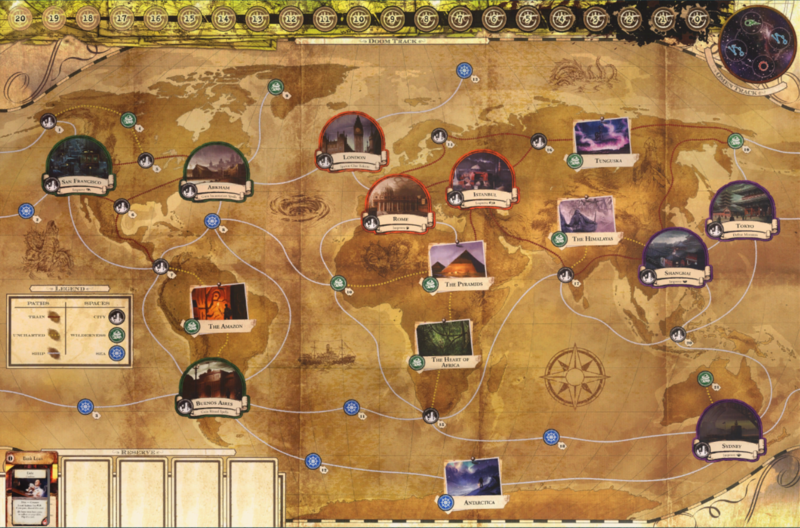 The current mystery needs an artifact, and apparently the best way to get an artifact is with an expedition, but only Pete can reach that this turn. 2. Close gates. Gates will kill us, eventually. Right now this is difficult because of that beefy D-hole. I'm hoping tokyo will help us kill it; if I can weaken it some I may be able to finish it off. 3. Get stronger so we can better accomplish 1 and 2 later. This is a broader category; since you're an influence-monger acquiring assets should definitely be a part of that. Another could be using city encounters to improve stats or gain spells. I'll go ahead and lock in acquire assets then take a sea ticket. Note that the Forbidden Tome is a bit less useful for Hank thanks to his passive ability. But if you're planning on doing a lot of monster-fighting, I suppose there's nothing better for you there. Yeah, I did see that. I think it's best unless someone really wants the Arcane Tome and I can find a way to hand it to them. I see myself as combat first and foremost, and closing gates/expeditions second. Let's do this: I'll take both Forbidden Text and Police Assistance, unless someone else says I should take the Tome when putting their move in. Turtle, on game strategy: it's also useful to gather clues (for closing gates, or for re-rolls in a pinch), but I don't think you have a way to get to a clue this turn anyway.